The name Hamilton means 'beautiful castle', 'Cadihou', in the original Celtic language. King David I of Scotland made Cadzow a Royal Barony in the 12th century. Later King Robert the Bruce gave the Barony to Walter FitzGilbert of Hameldone. One of Walter's descendants married into the Scottish Royal Family and was created Lord Hamilton. The name of the family manor in Cadzow was changed to 'Hamilton' by Royal Charter in 1445. 'Cadzow' gradually faded from the map and Hamilton came into focus. In the next century Mary Queen of Scots came here to confer with her ally the Marquis of Hamilton before the disastrous Battle of Langside. The town was later put to the torch as a reprisal for the Hamiltons' loyalty to Mary. The years moved on. Oliver Cromwell briefly set up his military headquarters here. A generation later, the nearby Bothwell Bridge echoed to the clash of battle as the Covenanters suffered a crippling defeat and fled for refuge into the woods of Hamilton Palace. Amid the turbulent swirl of history, the townspeople and country-folk quietly got on with the less dramatic business of earning a living. Farming, spinning, lace-making and weaving were among the thriving local industries. Coal mining had begun as early as the Middle Ages. Meanwhile the Hamiltons continued to dominate the local aristocratic landscape. Just a few miles to the north of Hamilton lies the village of Archibald The Grim named after the 3rd Earl of Douglas, Archibald was the man who founded the Church of St Bride in 1398. As you approach Bothwell, the church's 19th century sandstone tower rises above the huge Gothic buttresses and the original roof. The roof is unique, it's covered in heavy stone slabs. Interesting features include an elaborate monument to the 3rd Duke of Hamilton, a window by Burne-Jones, and the grave-slab of Walter de Moravia, the builder of Bothwell Castle. Head outside to start the one-mile journey to the castle itself. But before you leave the church precincts - pause. Here you can admire the elaborate memorial to Joanna Baillie, a local playwright and poet rated by Sir Walter Scott as one of the most gifted authors of her time. When 'Walter de Moravia laid the foundations of Bothwell Castle several centuries of violence and bloodshed were to be set in stone. The fortress was captured and recaptured by both the English and the Scots during the Scottish 'Wars of Independence. And at this time 'Walter FitzGilbert was to demonstrate his finely sharpened survival skills. FitzGilbert was actually governing the castle for the English. He surrendered it to Robert the Bruce's forces after the Battle of Bannockburn. His reward - the Barony of Cadzow. The castle itself was soon dismantled, then rebuilt, then destroyed again. Now it is a magnificent red sandstone ruin set amid woodland, high above the steeply sloping banks of the River Clyde. Widely regarded as the finest building of its type in Scotland, the castle is dominated by towers and curtain walls. The sheer size is breathtaking - and yet, amazingly, what you see is only a portion of what was originally planned. BRODICK CASTLE This red sandstone castle nestles in dark trees at the foot of Goatfell Mountain on the small but beautiful Isle of Arran. The site has been occupied by a stronghold of some kind since the fifth century. It was probably destroyed and rebuilt countless times during its turbulent history. was the guardian and regent of Queen Mary. As the home of the Dukes of Hamilton, the castle was occupied by Cromwellian troops after the first Duke was executed during the Civil War in 1648 and the second died in battle just three years later. 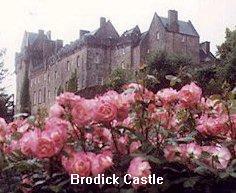 Brodick Castle eventually passed into the hands of Mary, Duchess of Montrose (daughter of the 12th Duke of Hamilton) who revitalised the gardens. Since her death in 1957 it has been owned by the National Trust for Scotland. Inside are paintings, porcelain and furniture from the various owners. It is also home to the art collection of 18th century author William Beckford of Fonthill whose daughter married the 10th Duke of Hamilton. One of the rooms is known as 'Bruce's Room' but since the castle was all but destroyed in 1455 and 1544, it is unlikely that Robert the Bruce actually stayed in it. LENNOXLOVE Lennoxlove was purchased by the 14th Duke of Hamilton and is furnished with many of the treasures from the magnificent Hamilton Palace in Lanarkshire, which had to be dismantled in the 1920s because of subsidence due to coal mining. 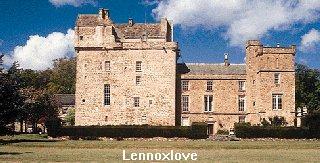 Lennoxlove occupies an enormous 2,287 acre estate which is located just 17 miles from Edinburgh. It is a working estate with the main crop being cereal grains and potatoes and the estate is complete with a saw mill and wood treatment plant. A herd of the famous Scottish white cattle roams the green fields of the estate, the last such herd to be found in Scotland.